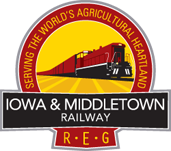 On January 1, 2019, one of Rail Enterprise Group’s newest operations, the Iowa & Middletown Railway, will begin operations at the Commerce Center of Southeast Iowa in Middletown, Iowa. Commerce Center of Southeast Iowa is a 19,000 +/- acre facility featuring hundreds of thousands of square feet of existing building space and over 150 acres of industrial zoned land available for development. The Complex is strategically located on a BNSF mainline in the agricultural heartland of the country only seven miles from the Mississippi River. Its central location will provide excellent regional market penetration and quick and easy access to major shipping lanes (rail, highway, and seaway) for rapid movement nationally or overseas. The Rail Enterprise Group has already started the process of bringing our successful logistics center model to the Commerce Center of Southeast Iowa. The new logistic center will offer customer-centric, multimodal transportation services combined with industry-leading transload, cross dock, warehouse, and packaging services, including specialized logistics services for the the ag industry. Because the Commerce Center of Southeast Iowa is part of a larger Department of Defense facility, it also contains unique, specialized infrastructure – including 2,500 rail car spots – that will allow it to handle an even greater range of services and commodities. Iowa & Middletown Railway crews will provide multiple daily switches to all customers allowing very efficient utilization of rail cars and enabling customers to limit (if not completely avoid) demurrage costs. 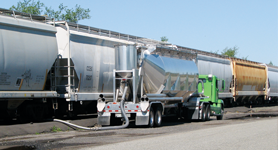 REG is working to develop cross dock, warehousing, bulk products transloading, reloading, and on-site trucking services from industry-recognized 3PL partners. These services will be able to handle a wide range of products: grains and grain products, fertilizers, bulk foods (corn, soybean, etc. ), perishables (vegetables, etc. ), frozen foods, oils and syrups (corn/soybean), and canned goods, plastics, resins, machinery and components, plastics products, generation equipment, farm and construction equipment, wind energy components, and more. Car storage: individual cars or unit trains; long-term, short-term, or loaded storage-in-transit (non-hazardous only). Over 100 miles of rail and one switching yard with a total capacity of 2,500 carspots. Railcar maintenance and cleaning on-site. 25,000 SQ FT Warehouses/storage buildings with rail and truck door access. 152-acre State of Iowa and BNSF Certified Site available; perfect for 50,000 - 300,000 SQ FT building. Manufacturing support program available. 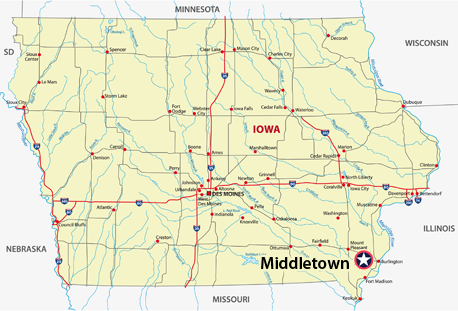 Routes to and from the Iowa & Middletown Railway via BNSF Railway. The Commerce Center of Southeast Iowa is located on Highway 34 (direct access), 5 miles from Highway 61, 60 miles from I-74, and 71 miles from I-80. The Center is seven miles from the Port of Burlington on the Mississippi River.